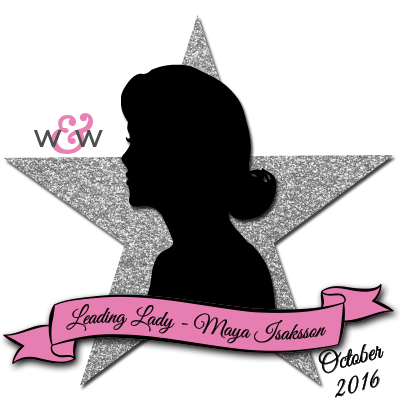 Today we are excited to introduce our October Leading Lady, Maya Isaksson. Maya caught our attention early on by participating in our challenges. In fact she was one of the winners of our 1st Birthday Bash Guest Designer Contest and obviously she was our guest designer for our April/May 2015 Release where she dazzled us. Maya does stunning work that is full of pattern, texture and terrific techniques! Over the next few Saturdays in Maya will be leading us on a journey of her own design and imagining. Make sure to visit her blog, Little Outburst of Creativity, to see more from her and for a chance to win a giveaway! Give Maya a big round of applause to welcome her as she steps onto the stage for her first performance as our October Leading Lady! Hi everyone! This is Maya typing and I am super excited to be invited to be Leading Lady for October here at the Winnie & Walter blog. I discovered Winnie & Walter right around when they started and has been following the blog and loving the stamps ever since. I was ridiculously happy when Shay asked me to be Leading Lady for October, I started planning in my head right away. The former Leading Ladies have been such an inspiration to me, as well as the Talent. I hope you will get some ideas and inspiration from my posts this month, as I have from theirs before. Shay has been super generous as usual and given me a $30 gift certificate to give away in my blog, so in the end of the month after all my five posts are up I will give it to someone who has commented on one of my Winnie & Walter posts during the month. I thought I should introduce myself briefly before getting on to the cards I made for todays post. I live in the south of Sweden with my husband, two kids and three dogs. I have a degree in applied electronics for embedded systems but I have also studied organisational psychology and worked at a newspaper among other things. Right now I work at a small international development company. On my spare time, when I'm not crafting, I like to design things. I have a small Etsy shop selling cut files and I have even designed a few stamp sets, a dream that came true for me. Two of our dogs are Salukis and we take them to the race tracks every week for practice but we don't compete. We also help out at the tracks taking goal photos at practice and competitions. We are a pretty geeky family and my husband is also a developer. Right now our big project is to build an arcade game, it's really fun and the kids look forward to getting to play when it's done (and so do I). So let's get on to the fun stuff. The cards. I instantly thought of the idea to do negative coloring. I wanted to try to mask the stamped images and color only the background. I used a few different kinds of coloring and it turned out really fun! I really love to make backgrounds and this technique is perfect for playing with colors. I have only used watercolors of different types for my projects, but you could use your alcohol markers with an airbrush for really smooth backgrounds. For my first card I did a fall theme. I love the leaves in In Bloom: Renee's Leaves and they look perfect in all colors. I stamped them in brown ink to soften them down a bit, masked them with masking fluid and watercolored the whole background. I added some drops of water after the background was dry and it gave some life to the background. It's not as crisp as when you use distress ink but all watercolors react to water, even though the intensity varies depending on paper and type of watercolor. I also splattered some dark brown watercolor over the card with a small brush to make tiny speckles. The sentiment is from Happiest of Holidays with Evelin T Designs. The Essentials: Audrey Cutaways is a perfect set of dies, I reach for it all the time, I used it to cut out the tags for the sentiment. For my second card I used another great set, True, where I used the star and masked it with masking fluid. I made the background using distress ink this time. I pressed some of my ink pads to my glass cutting mat. Sprayed water on the colors, pressed the card into the ink and dried it before repeating the process until I was happy. Here I used a die to cut off the top third of the card and mounted it using foam adhesive. I let the sentiment stick out of the cut. For my third card I used my favorite set, My Precious. I stamped some of the gems in a pattern, masked them off and used watercolor to make a rainbow. When it was dry I splattered some gold ink on top of it and cut a diagonal strip off the panel to add my sentiment. The panel is raised up using foam adhesive. This card is super bright and fun, I really love a nice rainbow of colors. So that's it from me for this first week. I can't wait to show you what I made for next week. See you then! Until then you are very welcome to visit my blog Little outbursts of creativity and leave a comment on the Winnie & Walter post for a chance to win the $30 gift card that Shay sent me to give to one of you. Thank you for having me as Leading Lady for October! Awesome cards, Maya!! So many things you can do with just one technique! Maya I just love these cards! I also love hearing all about your life! Thank you for sharing all that. You are quite busy and gifted in so many ways. :). Thank you for sharing your inspiration! What a busy life! Great cards. I love the white images on gorgeous colored backgrounds. What beautiful cards! I need to give that technique a try! looking forward to seeing what you have in store for October! Gorgeous cards to kick off Maya's Leading Lady posts! Looking forward to more! Love the white images against the colored background. I love the backgrounds on these cards! Your backgrounds are stunning, and really showcase the stamps! Maya, I'm madly in love with your negative colouring! The background colours are stunning and the black and white images pop! CONGRATULATIONS on becoming Leading Lady Maya!!! Great getting to know you, LOVE your style and look forward to seeing more of your creations!!! WOW! Certainly easy to see why you're a Leading Lady: creativity in abundance revealed here! Your negative colouring: gorgeous! A technique added to my 'must try' list! Congrats Maya on your Leading Lady spot! Amazing cards!!! Maya I am so sorry to be late to the celebration! You have used a beautiful technique - love the 'uncoloring! 'and the gorgeous backgrounds you've created, too! Congrats on your Leading Lady role ... now off to see what this week brings - I know it will be phenomenal! FAbulous backgrounds with this technique. Beautiful cards! Love how you cut and placed the sentiment in the second one! Loverly colors used on your cards! October Color Combo with Heather H.
WCMD 2016 | The Big Hop!